Note: The following was written by James Hartman in 1995-96 as his Masters in Biology thesis at Emporia State University. Used with permission. Pottawatomie Creek is a tributary of the Marais des Cygnes River. [It flows from about ten miles east of the Wolf Creek Nuclear Plant to the Marais des Cygnes just east of Osawatomie.] The study sites include eight riffle sites located on three tributaries and in the main channel. [The] Pottawatomie Creek watershed drains approximately 142, 074 ha (Pottawatomie Creek Watershed Joint District Number 90, 1972, General Plan, Anderson Co., Kansas, 38pp., unpublished) in Coffey, Anderson, Linn, Franklin, and Miami counties, Kansas. The area in which this study was conducted makes up more than half of the drainage of this watershed and was restricted to only Franklin and Anderson counties. Map of study areas. Locations are approximate. For bigger image, click here. Two additional sampling sites (NF5 and NF6) were located on the North Fork Pottawatomie Creek (NF), above the confluences of SF and CC. The NF sub-watershed is characterized as mostly flatland terrain, draining cropland and pastureland. [The North Fork Pottawatomie Creek flows from Osage County until joining with the main branch near the confluence with Cedar Creek.] The last two sampling sites (PC7 and PC8) were located downstream on Pottawatomie Creek (PC) before its confluence with the Marais des Cygne River. The PC sub-watershed is characterized as a broad floodplain containing predominantly cropland, with adjacent hills draining woodland and pastureland. Site PC7 is located between the confluences of CC and SF on the main channel of Pottawatomie Creek, and PC8 is located below the confluence of SF. [The PC8 sample is located near Lane and is at the site of Dutch Henry's Crossing. In 1856, after hearing about the sack of Lawrence, John Brown selected a party to go on a private expedition. Late in the evening of May 24th, the party--consisting of Brown's sons Frederick, Owen, Salmon and Oliver, Thomas Weiner and James Townsley--called at the house of James P. Doyle and ordered him and his two adult sons, William and Drury to go with them as prisoners. Doyle's 16-year-old son, John, was spared after his mother, Mahalia pleaded for his life. The three men were escorted by their captors out into the darkness, where Owen Brown and one of his brothers killed them with broadswords. John Brown did not participate in the stabbing but fired a shot into the head of the fallen James Doyle to ensure he was dead. Dutch Henry's Crossing along Pottawatomie Creek near Lane. Each of the eight sites were sampled three times for physiochemical data and fish in June, July, and August, 1995. Each sampling site consisted primarily of riffles, nevertheless, because of the lack of complete uniformity in sites some associated pools and runs were included in the sampling regime at each site. Physiochemical data were recorded at each site on each sampling date. Environmental variables measured were depth, width, length of sample reach, area of study riffle, percentage composition of rock, cobble, gravel, sand, and silt substratum, substratum embeddedness, and percent substratum covered with algae. a bigger map, click here. Depth was measured using a meter stick at 1 m intervals transversely across the approximate middle of the study riffles and the mean for these measurements was then determined. Width of riffles was recorded as the mean of width measurements taken at the beginning, middle, and end of the sample reach. Substratum was sampled with a shovel (Grost et al., 1991), and visual estimation of percent composition of substratum was based on the modified Wentworth scale (Cummins, 1962). Embeddedness was coded on a scale from one, very loose substrate, to three, very heavily embedded with silt (Fuselier and Edds, 1994). A percent of substratum covered with algae was estimated by visual inspection. Measurements of variables for water chemistry, stream flow, water clarity, and shade were also recorded at each study riffle. Measurements of pH, total hardness, total alkalinity, dissolved oxygen, nitrate, and phosphate were taken using a Hach water analysis kit. Water temperature was determined using a standard Celsius thermometer. Stream velocity and discharge were calculated using a float and stopwatch as described by Andrew and McEwan (1987). Water clarity was characterized on a three-point scale as clear (1), slightly murky (2), and murky (3). 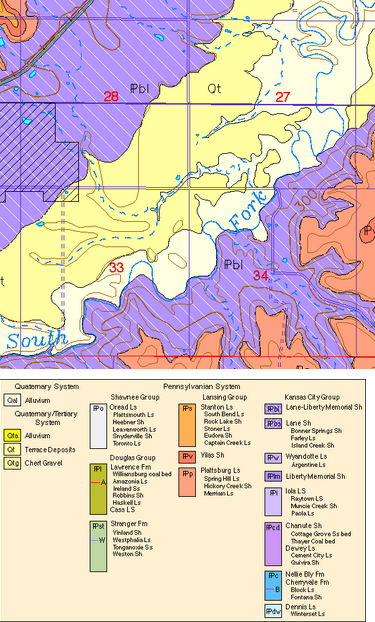 Riffle sites were also characterized as predominantly shaded or unshaded. Sampling for fish included seining riffle sites thoroughly. Fish were collected using a 5 mm mesh seine which retained fish 20 mm in total length or longer, but permitted postlarvae or small young-of-year to escape (Matthews, 1986). All of the captured fish were placed in five gallon plastic buckets filled with stream water, identified to species, counted, and then returned live to the stream. A few individuals of each species were retained for voucher specimens, preserved in 10% formalin, and deposited in the fish collection at Emporia State University. To standardize sampling, the up-river and down-river ends of riffles were first blocked with seines to prevent escape of fishes. The enclosed area was then sampled by kick seining. Each area was seined from the upstream end of riffle to downstream end and back to upstream end, with additional sweeps across riffles (Matthews, 1986; Bramblett and Fausch, 1991). The net used in kick seining was modified to a length of six meters, and disturbance of substrate began two meters in front of the seine, resulting in a sampled area of approximately 12 m2 (Fuselier and Edds, 1994). After the study riffle area was seined thoroughly the fish captured in the block seines were then sampled. All sampling took place when streams were at approximate normal flow levels. People seining a creek. Photo from isaacligocki.wordpress.com. Fish community structure at each study site was characterized by calculating percent composition of species, species richness, species evenness, and Shannon species diversity based on the total sample from each site. Species richness was determined using the index described by Menhinick (1964). Species evenness was found using the index described by Pielou (1966). Species diversity was represented by the Shannon Index (Zar, 1984) using natural logarithms (Gorman and Karr, 1978). Similarities in species assemblages were compared between sampling sites using Morisita's index of similarity diversity values. Kruskal-Wallis single factor analysis of variance by ranks (Zar, 1984) was used to test for differences in number of species sampled between sites. To compare differences in community structures between sub-watersheds, data from each pair of study sites in a sub-watershed were combined and species diversity, richness, and evenness were then calculated. A total of 31 species of fishes and 3,452 individuals representing eight families were collected during the study. The average number of species collected per site varied from 11 (PC7) to 22 (CC3). The most abundant species collected was the red shiner (Cyprinella lutrenis) which comprised 60.6% of the fish collected. No other species represented more than 8% of the total fish collected in my samples. Red shiners were the most abundant species collected at every site, except SF2. Red shiners made up only 2.2% of the fish collected at SF2, compared to 36 - 85% of the fishes collected at other sites. The next most abundant species collected were sand shiner (Notropis ludibundus), central stoneroller (Campostoma anomalum), and redfin shiner (Lythrurus umbratilis). A red shiner fish. Photo courtesy Wikipedia. Twelve species each made up one percent or more of the total sample and 19 species each made up made up less than one percent. These 12 species were designated as high profile species. Only six of the 31 species were collected at every site; all were high profile species and included the following: bluntnose minnow (Pimephales notatus), redfin shiner, red shiner, suckermouth minnow (Phenacobius mirabilis), longear sunfish (Lepomis megalotis), and slenderhead darter (Percina phoxocephala). Seven of the eight riffle sites were well represented with high profile species, including SF1 (10), SF2 (12), CC3 (12), CC4 (12), NF5 (11), NF6 (12), and FC8 (11). Only six of the high profile species were collected at PC7 which yielded the fewest total species of all sites, 11. 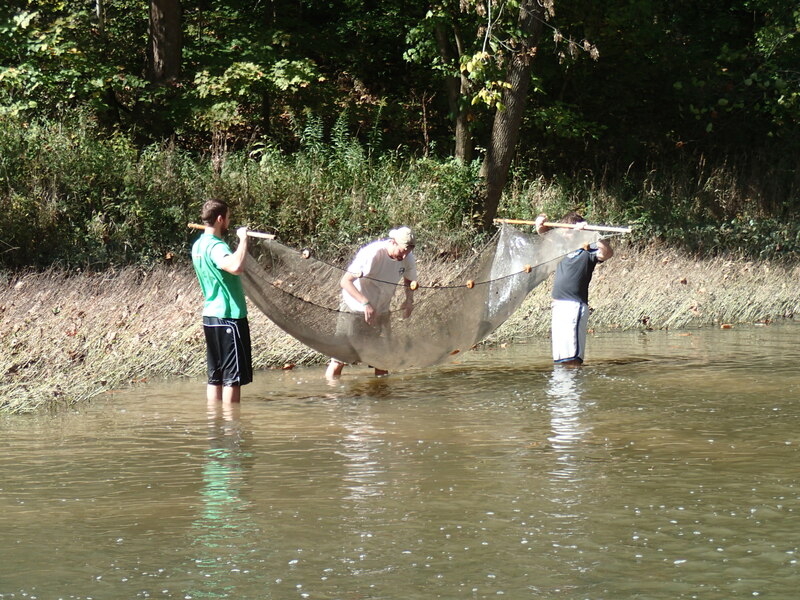 Nevertheless, the number of fish species collected did not differ significantly between study riffles. The Kruskal-Wallis single factor analysis of variance by ranks (Zar, 1984), for number of species sampled per site, resulted in p > 0.05, where chi squared = 14.067. 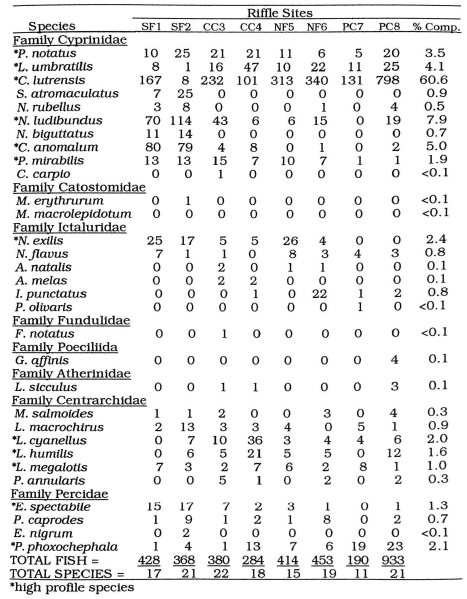 Of the 31 species of fishes collected during my study, 29 are native species (Cross and Collins, 1995). Introduced species were collected at two different sites, including one common carp (Cyprinus carpio) at CC3 and four mosquitofish (Gambusia affinis) at PC8. One species listed by the Kansas Department of Wildlife and Parks as threatened, the hornyhead chub (Nocomis biguttatus), was collected at two of the eight sample sites. Eleven hornyhead chubs were collected at SF1 and 14 were collected at SF2. Chart of fishes found in riffle communities of Pottawatomie Creek. The results of this study indicated that, in general, fish assemblages as the eight sampling sites were highly similar. Morisita's index of community similarity between sites ranged from 0.80 to 1.00. According to Ross et al. (1985) a Morisita's index value of 0.74 indicates a high degree of similarity between communities. Typically in this study, fish assemblages were characterized as having certain high profile species present, and most of these high profile species show a preference for riffle habitat. The great similarity between fish assemblages observed during my study may be due, in part, to the lack of significant differences in physiochemical variables between study sites. These results are in agreement with those of Cross and Collins (1995); Gorman and Karr (1978); Sheldon (1968); Smith and Powell (1971); and Stevenson et al. (1974) who claim that species membership is associated with habitat availability. I originally hypothesized that the diversity of fishes in the study streams would vary significantly according to site locations. Because of the consistency of high profile species found at all sites, lack of significant differences in species richness and diversity of fish assemblages, and the high similarity index values among sites, I reject this hypothesis. However, trends in fish assemblages differences among sites warrant further consideration in order to gain insight from the observation I made. Red shiners tended to dominate in percent composition at most sites, which is in agreement with the findings of Matthews and Gelwick (1990) for streams in Oklahoma and Wenke et al. (1993) for streams in Kansas. Cross and Collins (1995), state that red shiners are tolerant of stressful conditions and adaptable to unstable conditions. These opportunistic fish occupy habitats vacated by less less tolerant, habitat specific fish species. Thus, a fish community dominated by red shiners may be indicative of a disturbed habitat. In addition to a sparsity of red shiners, the fish community at SF2 exhibited the highest species richness, evenness, and diversity index values relative to the other sites. Also, the communities at SF2 and SF1 included populations of a Kansas threatened species, the hornyhead chub. Because the sub-watershed of SF drains mostly pastureland and woodland and the water is consistently clear, this stream section may be considered relatively undisturbed, and therefore an excellent habitat and fish community at SF2 were compared with habitats and fish communities at some of the other sites in this study, my observations led me to hypothesize that some of the other sites may have disturbed habitats. Matthews et al. (1988) make the point that natural variability of fish assemblages in relatively undisturbed streams are of interest because they provide a benchmark against which to judge the effects of human perturbations. Thirty one species of fishes representing eight families were collected from riffles in four sub-watersheds in the Pottawatomie Creek watershed. Seven of the eight study riffles were well represented by twelve high profile species. Comparisons of study riffles revealed a high degree of similarity for fish assemblages and physiochemical variables among sites. No significant difference (p = 0.05) were found for number of species collected per site or for species diversity among sites. However, some trends indicating differences were found when comparing pooled data for fish assemblages of the different sub-watersheds including significant difference for species diversity. Although measurements of physiochemicals variables were relatively similar among study riffle sites, water clarity varied. A trend for water clarity and fish species diversity was apparent. In general, sub-watersheds with clearer water had fish assemblages greater in species diversity indices values than sub-watersheds with murky water. All study riffles, with the exception of one, were dominated by red shiners. Red shiners made up 61% of the total fish collected. Two study riffles within the same sub-watershed, contained a threatened species, the hornyhead chub. The trends found in this study could be an indication of the relative disturbance of some riffle habitats in comparison with other riffle habitats within the same watershed drainage. The disturbance of riffle habitats seem to correlate with present land use practices being used in this watershed.